Red Bull — the caffeinated energy drink. Because they offer damn near the same experience: Stimulating caffeine rush slightly offset & complemented by a side of sedative taurine and mood boosting B vitamins. However, unlike Red Bull, Ryno Power Motivation trims off the sugar, replacing it with more sedative anti-anxiety nootropics for an even cleaner, healthier caffeine experience. Granted, Ryno Power Motivation just barely fits in these healthier ingredients, supplying each at sprinkle dosages, but STILL …it’s a step up from Red Bull. So now that I’ve set the bar that low, let’s get on with the review. Who Takes Ryno Power Motivation? Conclusion: Does Ryno Power Motivation Work? Ryno Power Motivation: Manufactured by Ryno Power, designed to enhance motivation — BOOM, there’s your review. NEXT! The leading ingredient in this formula: Caffeine — the world’s favorite drug and a crutch to the nootropic community for its cheap, easy mental stimulation. Ryno Power Motivation complements the caffeine well with a few well-chosen anxiolytic nootropics, however their dosages are purdy lowww. Other Ingredients: Gelatin, Silicon Dioxide, Magnesium Stearate, FD&C Green #3, FD&C Yellow #5, and Titanium Dioxide. Directions: See the Ryno Power Reference Guide sub. Vitamin C (as Calcium Ascorbate) – This antioxidant vitamin is great for general brain health but is particularly useful to smart drug users experiencing a smart drug comedown — or more specifically: Adderall crash. Vitamin B6 (as P-5-P) – Decent dosage in the preferred bioactive P-5-P form of this circulatory enhancing mood booster vitamin. More on Vitamin B6. Pantothenic Acid (as D-Calcium Pantothenate) – The body requires this B vitamin for a number of metabolic pathways, however deficiency in pantothenic acid is rare. Still, not a bad addition to this supplement. 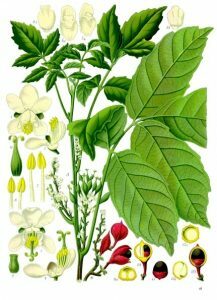 Guarana Seed Extract (std. to 50% caffeine) – For quick, natural bursts of caffeinated focus, guarana is one of my go-to options. Of this 360 mg dosage, half (180 mg) is caffeine. 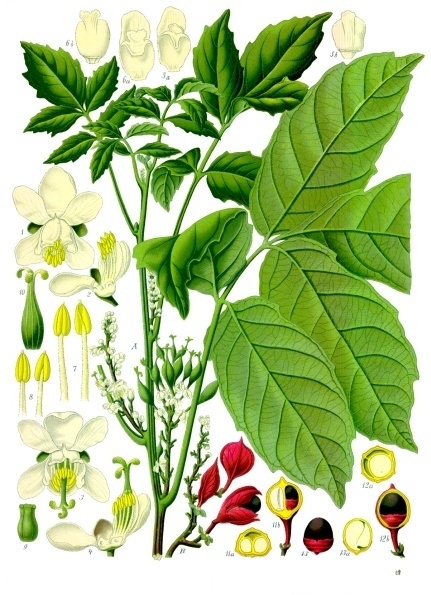 More on Guarana. Vitashure Caffeine – VitaShure sells “microencapsulated vitamins, minerals, amino acids, and bioactive substances,” presumably for slow-release effects. So on top of the 180 mg caffeine, you’re also getting 35 mg of slow-release caffeine. More on Caffeine. Bacopa Monnieri – A Geek favorite, delivering well-researched adaptogen effects and pro-memory boosts on learning — although this plain form & light dosage are weak sauce. More on Bacopa. L-Tyrosine – This form is also weak sauce (N-Acetyl-L-Tyrosine is better) but I’ll gladly take that 334 mg dosage of this reliable anti-stress, pro-focus amino. More on L-Tyrosine. L-Taurine – Often associated with energy drinks (SEE: Red Bull), despite doing nothing for energy — in fact, taurine operates as a sedative, relaxing cognition and potentially, slightly offsetting Ryno Power Motivation’s caffeine… maybe. More on Taurine. Inositol – At high doses, inositol is believed to act as an anxiolytic. However, this 108 mg is nowhere near accomplishing this. Glucuronolactone – Another popular energy drink ingredient, yet research on this compound is way too low to justify or explain this popularity. Bioperine® Black Pepper Extract – A smart addition to any formula, nootropic or otherwise, for its nutrient absorption benefits that are accomplished in only tiny doses (5 mg). L-Theanine – The only nootropic way to supplement caffeine is to combine it with L-theanine, a non-sedative relaxant that smooths out the jittery side effects of caffeine. I’d prefer to see 2, 3, or even 4 times this dosage here, though. More on L-Theanine. 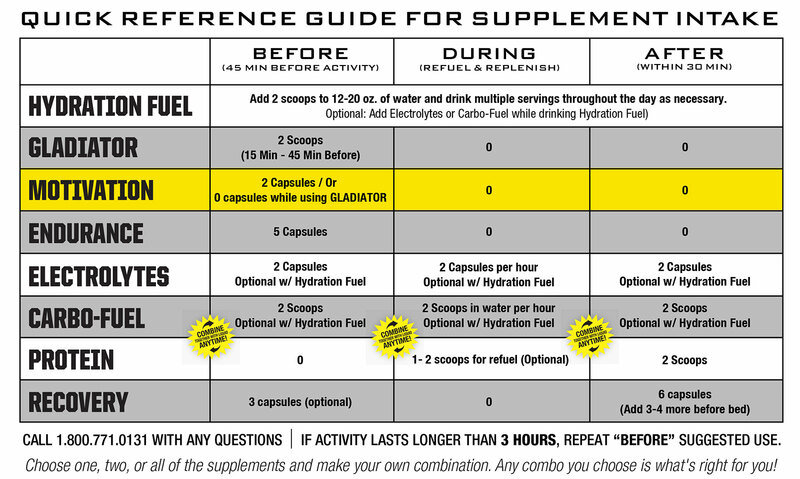 As indicated by the Ryno Power QUICK REFERENCE GUIDE FOR SUPPLEMENT INTAKE, there are a number of Ryno Power supplements, each titled by their function — with exception to Ryno Power Gladiator …unless killing your peers for entertainment is a valid form of dietary health now, or something. 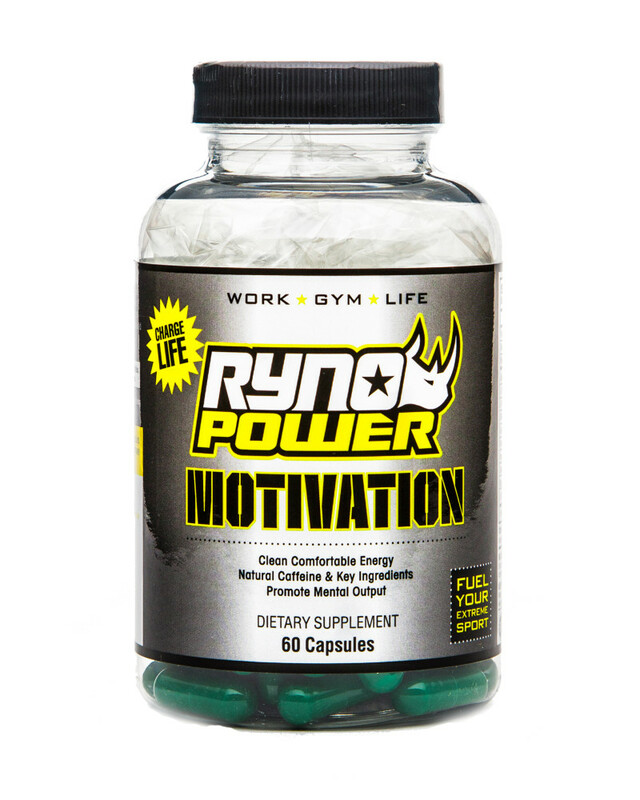 Ryno Power Motivation is a nootropic stack intended to boost MOTIVATION. And it accomplishes that with: CAFFEINE. Okay, not just caffeine — while much of Ryno Power Motivation’s motivational power comes from the supplement’s 200+ mg of caffeine (that’s a little over two 8 oz cups of coffee), the formula packs in a couple nootropics that also help with the dopaminergic pathways, most notably the B vitamins & L-tyrosine. These ingredients put Ryno Power Motivation on the same level as stimulant products such as 5 Hour Energy & Red Bull — however, this supplement exceeds that level by fitting in the adaptogenic, anxiolytic nootropics bacopa & L-theanine. Granted, the dosages on these two ingredients are way too low to have any noticeable effects …but still they’re there, slightly elevating Ryno Power Motivation’s caffeine pills a step above traditional, sugar-laden energy drinks, lattes, etc. As a caffeine source, Ryno Power Motivation is great, although I’d recommend stacking a little extra L-theanine on the side to further maximize the nootropic potential of this stimulating supplement. The caffeine is clean, natural, and not wrapped in layers of sugar, making Ryno Power Motivation a valuable substitute for energy drinks, coffee, etc. Ryno Power smooths out the caffeine with nootropic mood boosters & anxiolytics, such as L-tyrosine, L-theanine, taurine, inositol — although the dosages are suspect. $0.83 per serving is certainly cheaper than the average coffee serving, and this price per serving may be even cheaper at certain online vendors. Caffeine is still just caffeine, a crutch for nootropic manufacturers who’d do better by investing in actual brain enhancing nootropics. The dosages on many of the nootropic ingredients are weak sauce; there needs to be a more balanced ratio between caffeine & the anti-stress, anti-anxiety ingredients. The “Other Ingredients” are nastay and junkay and jennayyy. Work – Gym – Life — “Fuel Your Extreme Sport.” This is the copy presented on the Ryno Power Motivation label, indicating that this is a nootropic stack intended to enhance physical performance and/or work output for the extreme-o, grab-life-by-the-balls, personality-A types. 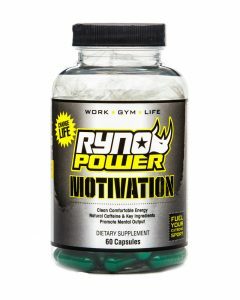 According to the Amazon customer reviews, many Ryno Power Motivation users seem to use it as a pre-workout supplement. SIDE NOTE: The Ryno Power website suggests that this product is safe for ages 13-99, however I’m going to say nah — I can’t imagine 13 or 99 year olds doing well by this much caffeine. 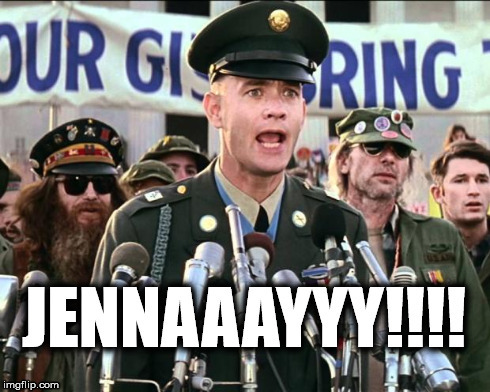 Not that it’s exceptionally overwhelming, but …nahh. You can buy Ryno Power Motivation through the manufacturer’s website or via various retailers such as Amazon, Bodybuilding.com, eBay, and more. Does Ryno Power Motivation “enhance mental and physical performance”? Yes — insofar as caffeine enhances mental and physical performance. And caffeine does enhance certain aspects of mental and physical performance, although its a stimulatory form of enhancement, meaning that it may also impair certain aspects of focus, mood, attention, etc. To caffeine junkies I recommend Ryno Power Motivation. It’s definitely a better caffeine option than the one I’m sure you’re currently on — at least it’s a cheaper caffeine option. To everyone else I say sure, but be sure to also check out the bona fide nootropic supplements to get a real nootropic cognitive enhancing experience. Ryno Power Motivation offers only a little bit of that and a ton of the familiar caffeinated explosion.